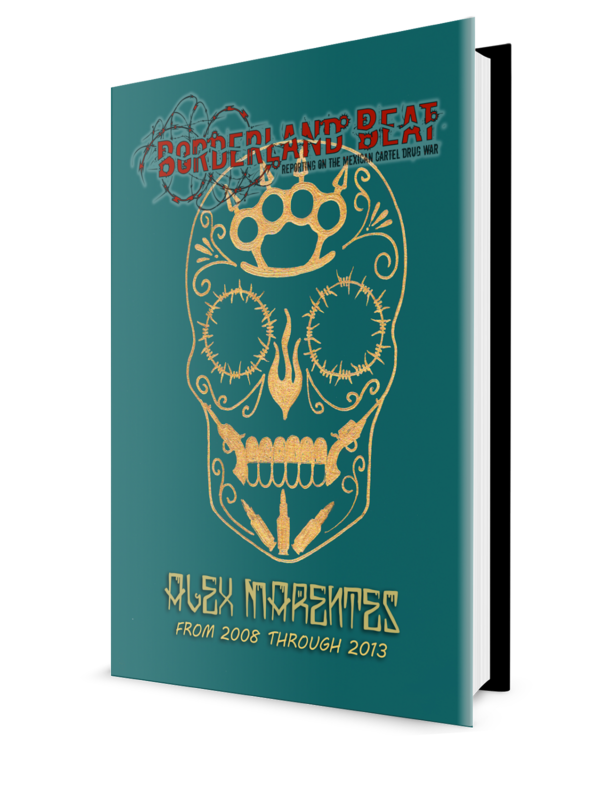 Happy day of the dead from Tijuana, Mexico! 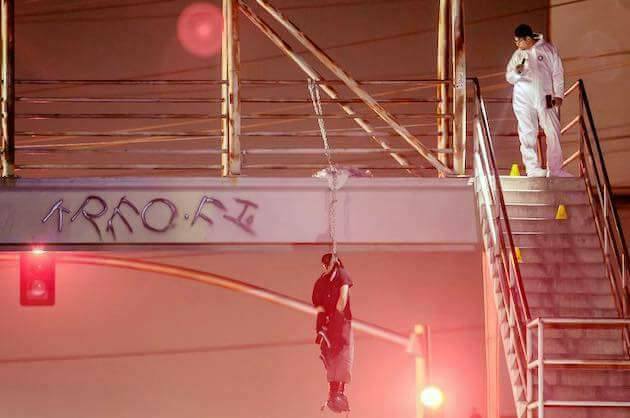 The body of a man, along with a narcomanta, was hung from a bridge that is located in Blvd. Benitez, by the area of the Comision Federal de Electricidad, in the Yamille Colony, of Tijuana. 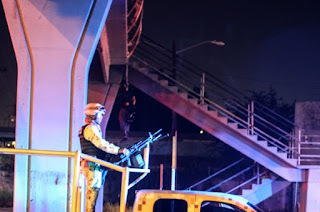 The frightening finding was denounced to the Central Emergency around 10:30 PM, Wednesday, November 2nd, and indicated that there was a person hung from a bridge, the same bridge where last September the bodies of several individuals were hung with a narcomessage. At the scene several municipal cops, elements of the Army and Federal cops arrived. "Asi van a kedar Todos los chapulines y Batakas de las lacras y chompas. Atte: CTNG"
"This is how all Grasshoppers and drums of the lacras and chompas. 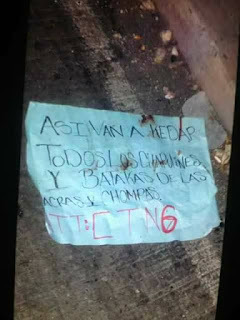 Atte:Cartel de Tijuana Nueva Generacion"
The victim, was tied from feet and hands with black adhesive tape, the face was covered with tape, the identity of the victim remains unknown. 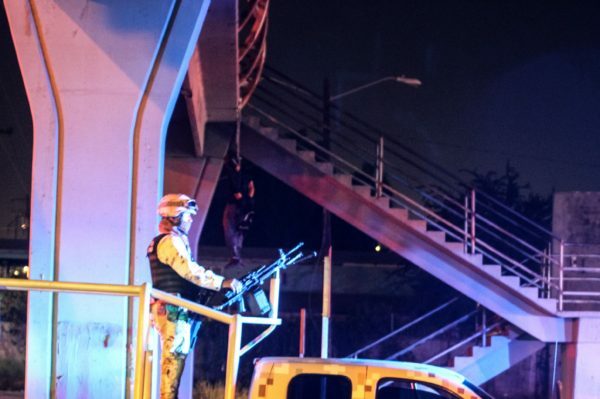 This is the second time that criminal organizations utilize this bridge to threaten rival cartels. 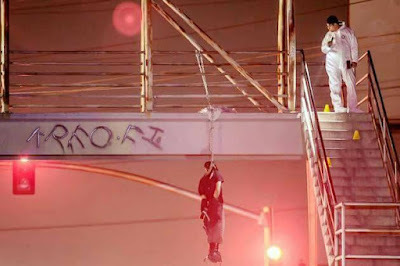 El Guero Chompas, cousin of Raydel Lopez Uriarte "El Muletas"
The man that was hung with a chain in Blvd. 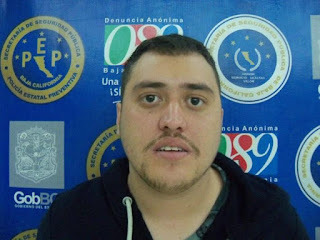 Benitez, was identified as a small scale drug dealer from La Sanchez Taboada, according to municipal cops and ministerial cops. Miguel Angel Ledesma Silva, "El Viejo Loco" of 40 years old, was detained in March of this year by municipal cops assigned to the Grupo de Operaciones Estrategicas (GOE). Back then he was arrested with a handgun, two shotguns and crystal meth. The message was directed to small scale drug dealers. Chapulines: Thiefs or people that sell drugs where they are not supposed to sell them or both. Batacas: I have no idea, however batacas is the same as a drum, and a drum makes noise...? Isn't chapulines also ppl who switch sides? A chapulin, is a person that is jumping connections. If you have a middle man you have to deal with, to deal with the boss, and you go to the boss trying to jump over the middle man, that's being a chapulin. Jumping over connections. chapulines are people that jump from cartel to cartel ..
A chapulin is anyone who comes from one side and goes to the next. Jumping over the middle man is not what a chapulin is. you are correct,is a person that is jumping connections. If you have a middle man you have to deal with, to deal with the boss, and you go to the boss trying to jump over the middle man, that's being a chapulin. Jumping over connections. Bacatas means a snitch or middle blower for those who are wondering. Bataka in tj means hit squad. They are also threatening the hitmen. Chapulines (grasshopper) are those who switch sides...alliances...loyalty. Usually as in cartels. Let me guess comandante Woof Woof anda limpiando en Tijuana too? Spelling is not their strong point. 9:16 es: "la mal sentada"
A chapulin aslo means when he changes flags. Why do they squabble so pointlessly over retail drug sales? Is there really that much money in it? 337, I think it's about power and control also. Saw this first thing this am. Connection with El Guero Champas ?? The way cjng/ctng are going they will end up with all of Tijuana soon. 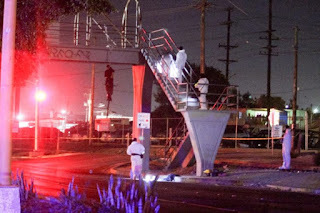 6:59 no problem, everything that rises has to come down, and I don't think cjng or any other tijuana cartel will last forever, not even at least 40 years like la chapa, or 50 like el mayate, or have 2 billion dollars to pay their kids fines. They just killed gross how do u compare a boss hit to this low level drug dealer lol ya they have tijuana so on lock lol mayo will never let go of tijuana. Chapo is overated. 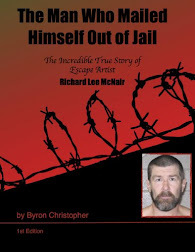 Worked a few years late 80s, locked up 90s, beltranes gave him all his plazas 2001-2007, lasted about 7 years on his own. Which is aroynd what mencho might last. Via Twitter...el chapo has handed over the reigns and has said his goodbyes. This is confirmed,,, what's next???? "WikiLeaks' Impact is Stratfor's bottom line"
A chapulin is a grasshopper..duh. Its an insect. Simple google translate bola de batacas. Chapulines means cartel jumpers. Switching sides. Battaka=killers . If you replace the word bataka with snitch it doesn't make sense but replace it with sicarios and the manta makes more sense just saying. 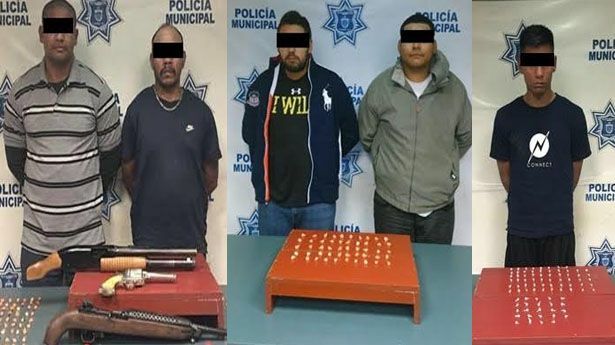 Chapulines, they mean all their retailers who have and could change sides now that Gross is dead, and batacas is all the "sicarios", that´s how they call the hitmans in Tijuana, batacas. Puro CDS .Todo Mexico es la Plaza del Jefe de la Sierra ...Chapo Guzman 2017 Hombre libre! Is this guy from Batopito, SI? WOW, 51 commentos, not one about the "los chapitos uriartes". We are really getting creamed by a bunch of Gattacas, I mean batakas. is it safe to say we now know what a chapuline is? @3:37 yes there is a lot of money. I'm not to sure what a pound of crystal goes for in tj, around $1,000 I think. a $20 of crystal is about half a gram. so $40 a gram there is 448 grams in a pound witch equals $17,920-$1,000 for the pound witch leaves you a profit of $16,920. So yea lots of money on the line. Who in mexico has 20.00 dollars to buy 1/2 gram? Maybe to sell to gente del gabachero, or sell pellizquitos de a peso in mexico. Chapo is running the show from the inside. Bussiness as usual. Chapulin can be interpreted 2 ways...neither is an honorable term.One is that of a trick who switches sides,the other of a greedy POS who secretly cuts out the middleman & both are punishable by death.Bataca is a Hitsquad.Anymore questions kids?FYI,the real movers & shakers are behind the scenes,these are curb servers that dont even know who their real boss is! !